One morning in prayer I began to think of Abraham, who stood before a rock to sacrifice his son Isaac on a lonely mountaintop in the midst of a wilderness. Many years later that mountain was the site of the one of the most magnificent structures in history, The Temple of Adonai. Built over that very rock and surrounded by the great city of Jerusalem, it housed the Ark of the Covenant, the throne of God. This stone promised to Isaac and Jacob’s seed would some day be fought over by all the nations as they sought control over the authority to mediate between God and man. The Lord began to bring to mind my own history. 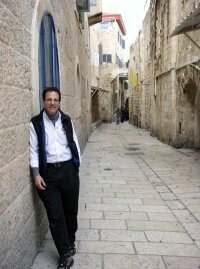 As a Jewish atheist in college, I went to Israel. Even in the midst of conflict, there was a strange feeling of peace there that I had never experienced. It was the first time I ever felt like I belonged somewhere, like I had come home. A couple of years later while I was alone, a supernatural force flowed through my apartment lifting a tremendous weight off my shoulders I never realized was there. I floated in it all night long. This began a seven-year journey through New Age and the occult until I thought I knew it all. When my Messiah found me and I asked Him into my heart, He poured out His Spirit on me in a powerful way. I recognized Him as the same power, or person, that had entered my apartment many years before. He spoke to my heart that when I had come to Jerusalem as a youth I felt at peace because I came to His home, the place of His temple, for Scripture says the Lord dwells in Zion. When I asked Messiah into my heart, He came to make His home in me, His temple, to set up his throne in my heart. He said I would now carry Jerusalem, His city of peace, everywhere with me, and I would never be alone again. As I meditated on these things, this song suddenly poured out of me. In a few minutes it was written, more like born, words and music all at once, but I put it aside thinking it was too slow and needed a more popular style. So “Come To Jerusalem” had its public debut the next day and it has been a favorite of all who have heard it ever since, especially in Jerusalem.